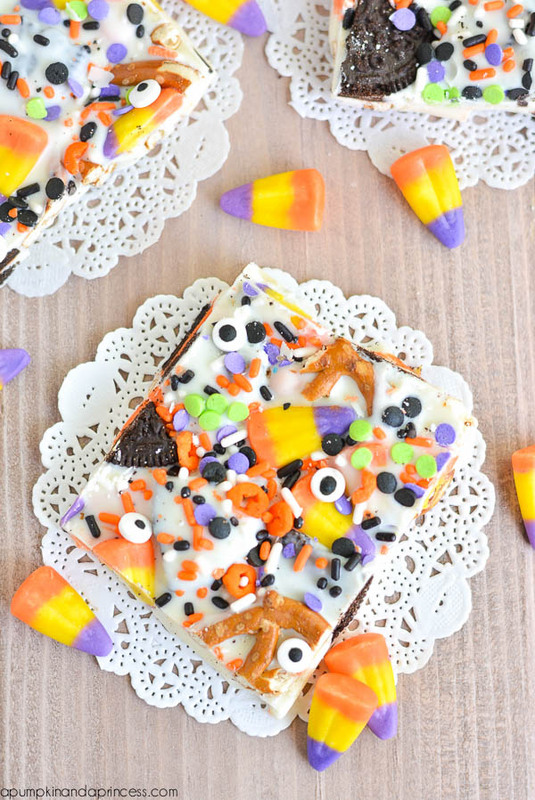 The night of the living dead is almost here, so what better way to get ready than with these top Halloween candy bark recipes? We found it all from creepy crawly to spooky. Browse the recipes below to find the one your little trick or treaters or Halloween-loving friends will enjoy most. Most people don’t like when their food stares back at them…unless it’s this googley eye candy bark. This candy bark is loaded with confetti-esque morsels and fun monster-like treats. If you want to make this recipe your own, change up the way you display and serve it. The chef made these candy bark pieces look Halloween chic in black and white striped cups, but you could try orange, black, patterned, graphic, and other designs. Just know this recipe is watching you, so choose something that’s easy on the eyes! Ghosts are a must-have for Halloween decorations and treats. That’s why we love this ghost Halloween candy bark so much. You won’t need a lot of ingredients—just white and milk/dark chocolate. And instead of the typical candy bark method that entails sprinkling a ton of different candies and bits into melted chocolate, you’ll just need a paintbrush or pointed tool (like the end of a fork or spoon). If you don’t want to be up against the clock and have to finish these ghosts before the chocolate sets, you can also use a hard icing to draw the ghosts on top. Then, you can package these up in cellophane baggies for trick-or-treaters, or put them in a glass cannister on your kitchen counter for your boys and ghouls. This is a great pre or post Halloween candy bark to use up candy corn—and enjoy a sweet treat! You’ll start with a white chocolate of your choice, then you can go minimal or crazy with your add-ins. 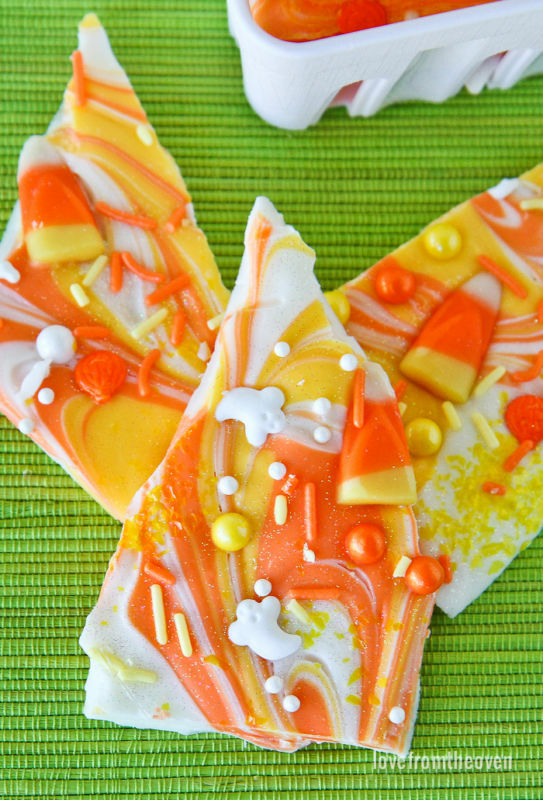 We love how this baker used swirls of yellow and orange, plus ghost sprinkles, regular sprinkles, and candy corn, but your candy bark choices are up to you! Need some more baking ideas? How about using black sprinkles in addition to orange and yellow to incorporate more Halloween colors? Or, you can add black cat shaped treats to the mix too. This candy bark is great with any of the above, so we’re sure you’ll whip up something wonderful. The Wicked Witch of the West is a famous villain, and a very Halloween appropriate inspiration! That’s why this melted witch candy bark is one of our favorites on this list. Each “witch” is already individually sized, so you won’t need to crack your creation once it’s dry. They’re also very hands-on, so if you have kids, this is a fun recipe to make together. This candy bark is Frankenstein green and overflowing with pops of signature orange and black. It’s also one of the easier Halloween candy barks to make. That’s because you won’t need to do anything besides melt the chocolate and sprinkle handfuls of your favorite green, black, and orange candies on top. It’s easy enough to find these ingredients in the grocery store, but if you’re having trouble locating cute and tasty skulls, you can buy them from Candy Store. Not everything needs to be guts and gore on Halloween. 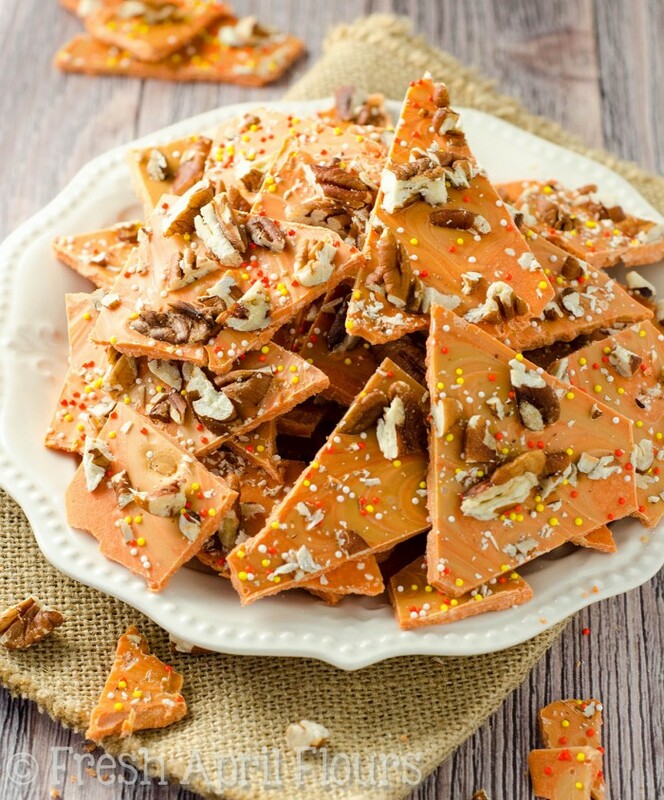 You can embrace the season and theme with this tasty pumpkin butterscotch bark. This is also a great recipe to stretch into Thanksgiving, so you can always make a big batch for Halloween and freeze some to defrost one month later. If you do that, just don’t include pretzel bits as they’ll get a little soggy in the freezing and thawing process. This recipe is already delicious as-is, but you can add caramel-covered treats to amp up the flavor. And, you can roast whatever nuts you use to bring out their natural flavor and deepen the flavor profile of the whole candy. Holidays seem to acquire colors on their own. However, for Halloween, the orange and black color palette is no coincidence. The oranges and yellows are there to mimic the fall leaves and the black symbolizes death. It’s morbid, but a fun fact to know! We like this recipe because the dark chocolate’s bitterness offsets the sweetness candy corn brings to the recipe. Depending on how sweet you like things, you can use milk, white, or dark chocolate. Even incorporate a little orange extract to make it yummier. 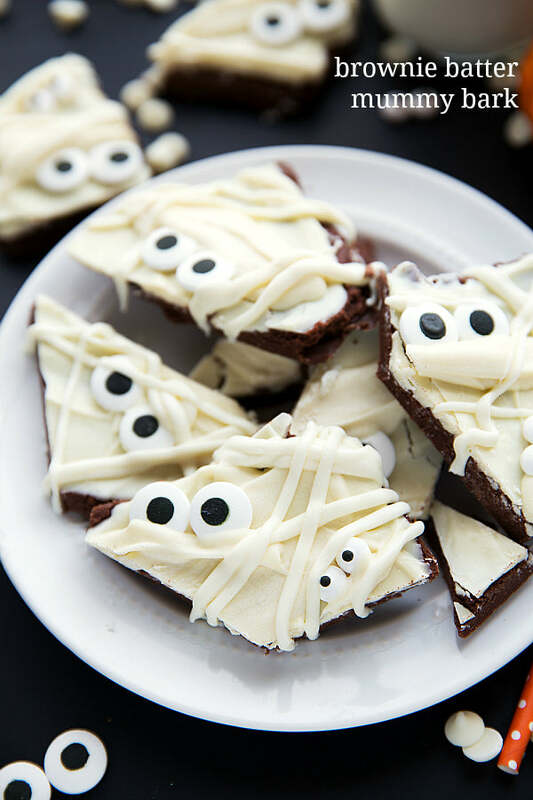 Mummies are a spooky monster perfect for Halloween costumes and desserts. This recipe isn’t candy bark per se because it uses a brownie base, but the melted milk chocolate on top qualifies it to be a yummy candy bark hybrid. This recipe will take a bit of time, since you’ll need to bake the brownies, melt the chocolate, let it all cool, and then layer on googley eyes and another drizzle of chocolate. But trust us, it’s well worth the effort! We’re calling this trick or treat bark since it seems like it would be unhealthy, but it’s actually pretty wholesome! That’s because this bark is made with a yogurt base and filled with fruit. We recommend using dried fruit to make this less perishable, but it’s ultimately up to you! If your kids are excited for Halloween, make this bark for breakfast and serve a few pieces on top of oat meal. Or, wrap some up for their bagged lunches, so they can enjoy a fun treat at school. The Cookie Monster is one of the most beloved characters on Sesame Street. He also just as lovable as a Halloween treat! Once again, you’ll need a lot of chocolate and food coloring. Then, the rest is easy. Break up cookie pieces or plop full size cookies onto the wet chocolate. Once it’s dry, you can add googley eyes and let your Halloween fans gobble the pieces up. Here’s a tip: This bark recipe is much easier to break up when the cookies aren’t whole, so we suggest using a hammer or rolling pin to smash them up. 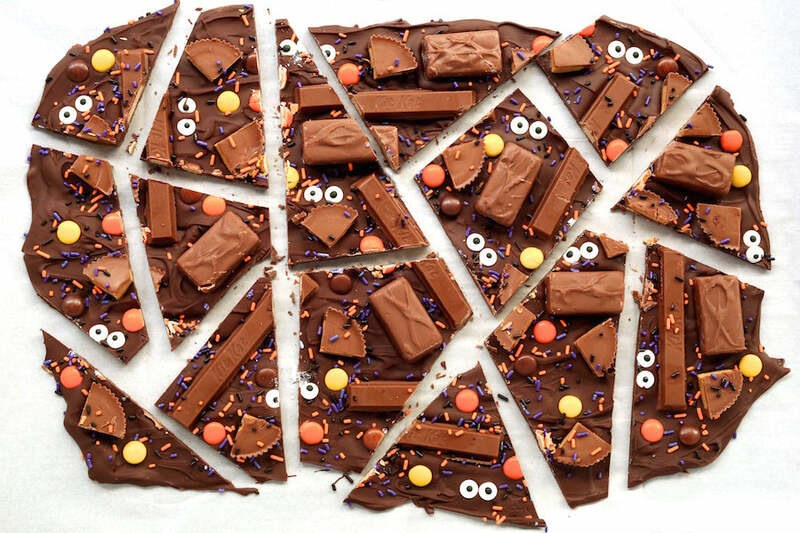 This final candy bark represents all that is good on Halloween—the candy bars. This one uses fun size bars of Snicker’s, Kit Kats, and Reeses Cups to take deliciousness and spookiness to a whole new level. This person did a good job of pre-chopping the candies to make them less of a mouthful. We suggest you follow suit so that every bite is balanced and not too sweet to eat!